FIT Adventurous Sports Travels adds a new chapter to her already challenging program of sports events: an ice skating marathon on the ice surface of the biggest fresh water reservoir in the world, Lake Baikal in Southern Siberia! Lake Baikal is about 640 kilometers long, while the largest width reaches up to 80 kilometers. With a maximum depth of 1642 meters and a total surface of 31.500 square kilometers (about the size of Belgium), Lake Baikal is the deepest lake and the largest fresh water reservoir in the world! More than 300 rivers end in Lake Baikal, of which the southern Selenga river is the biggest. The only river that leaves Lake Baikal is the Angara river, which joints the Jenisej river, before ending in the northern arctic sea. Since 1996 Lake Baikal is mentioned on the UNESCO world heritage list. 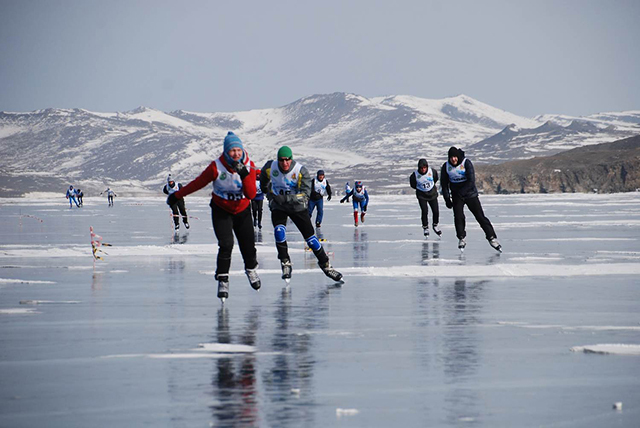 Like FIT Adventurous Sports Travels organises ice skating marathons on the Huanghe, the Yellow River in China, she will also attract and interest ice skating lovers to book for this challenging event on Lake Baikal! 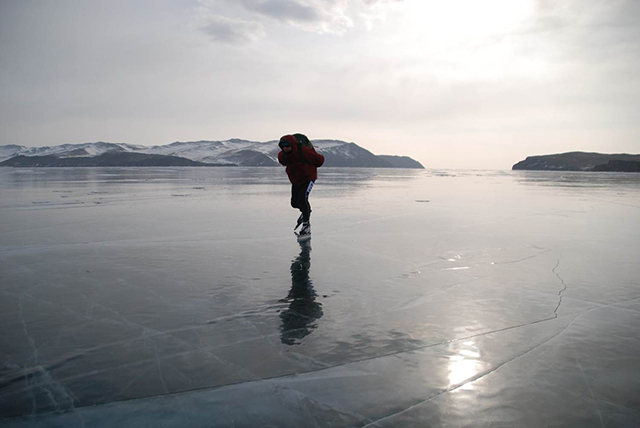 Based on own experiences, Stefan Rasing, head of FIT Adventurous Sports Travels, has already provided interesting information on previous ice skating tours that were held on Lake Baikal. And this information contained quite exciting details! The enormous space, the feeling of freedom and the breathtaking scenery, left Stefan with the idea to skate towards the end of time on this earthly planet! And see, soon this sports trip will also become available for ambitious skaters, looking for challenge and adventure! As from Spring 2017 FIT Adventurous Sports Travels will include this event in its overall program. In 2020: February 7 – 15! What is the target group for this sports event? This challenging event is ideally suited for members of ambitious ice skating clubs and associations. Teamwork, flexibility and a positive attitude and outlook to life are essential qualities for participating in this event! Of course individual registration is also possible! This sports event will take place with a minimum number of 15 participants. Ultimately before December 1, 2016 you will receive notice of affirmation regarding this trip. As soon as the minimum number has been reached, you will immediately receive this notice. Making a reservation doesn’t mean yet ‘having booked’ for this trip! Following arrival at Domodedovo Airport a train transfer will take you to Moscow, where an additional subway transfer takes you to your hotel. Moscow’s metro is one of the bussiest and most efficient subway systems in the world. Especially, the metrostations in Moscow centre are very beautiful and allow you to discover this Russian capital at your own pace this first day. After breakfast a tourist tour through Moscow is scheduled. An English speaking tourist guide will support you with ample information on the various sites and attractions. Following the breakdown of the former Sovjet Union and the transformation to capitalism, Moscow very rapidly became a combination of extreme wealth and luxury, next to decay and poverty in its former quarters, where communism prevailed. Old, grey and monumental buildings seemlessly change into into modern office buildings and ‘American style’ skyscrapers and signs. This busy and crowded metropole provides living proof of an aspect of world history: people and buildings breath the facinating past of Moscow and allow you to ‘enjoy’ this in barely 24 hours! The program calls for visits tor he Red Square and its Basilius cathedral, as well as the Historical Museum, the Lenin Mausoleum and the Kremlin. In the morning you fly to Irkutsk along the shores of the Angara river, between Irkutsk Reservoir and Lake Baikal. Irkutsk, with its nickname “Paris of Siberia”, is the largest economic, cultural and social city region of Eastern Siberia. After having taken lodgings in your hotel, you may participate in a city tour through this fascinating town, with its numerous attractions, classical architecture and many wooden buildings. Specifically, the Theofany cathedral, the Epiphany cathedral, Vladimir Abbey and the Holy Church of Charalampus should be mentioned here. A half an hour bus transfer along unpaved raods will take you to Sakhurta. Approaching this fishing village it takes an extra quarter of an hour to arrive at its centre. Our lodging site for today borders directly to the ice surface. 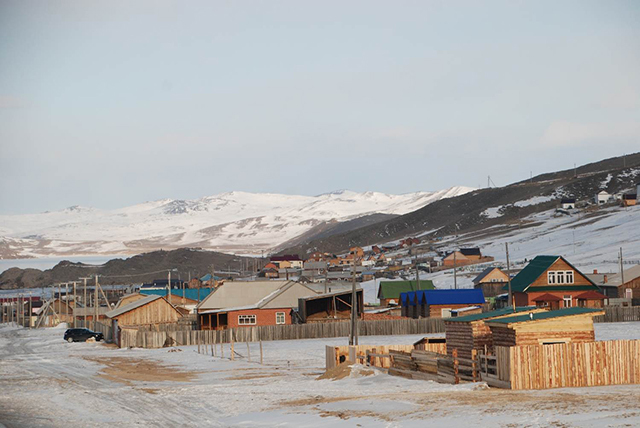 The afternoon offers a first opportunity for an ice skating warming-up in Southern Siberia. The ice surface grows to more than a meter in thickness, yielding an ice skating ‘floor’ that is crystal clear and hard as a rock. Almost fairy-tale-like the beautiful lengthy forms appear magnificently! The first day of ice skating! The trip takes you from Sakhurta to Boshaya Buguldeyka, some 65 kilometers away. You prepare your lunches at this morning’s breakfast. The Hoovercraft and additional snowmobiles are stand-by for safety and emergency support, if necessary. They will also be used for luggage and food transport. Anyway, the skates have been sharpened and you are ready for the ice skating trip! A second day of ice skating, taking you from Bolshaya Buguldeyka to Bolshoe Goloustnoye, 70 kilometers in total. Following this tour you will enjoy good Siberian food at the house of a local family. In addition, you might enjoy the opportunity to walk along the Ushkanja trail to Probaikalski Nature Park, 5 kilometers further down this path. In the valley, bordering the lake, your lodging facilities this night offer you 4 wooden buildings and an inviting opportunity to enjoy a relaxing sauna in a Russian ‘banya’, directly adjacent tot he lake. This third day ice skating tour of 60 kilometers, takes you from Bolshoe Goloustnoye to Listvyanka, also known as the ‘Riviera of Baikal’. 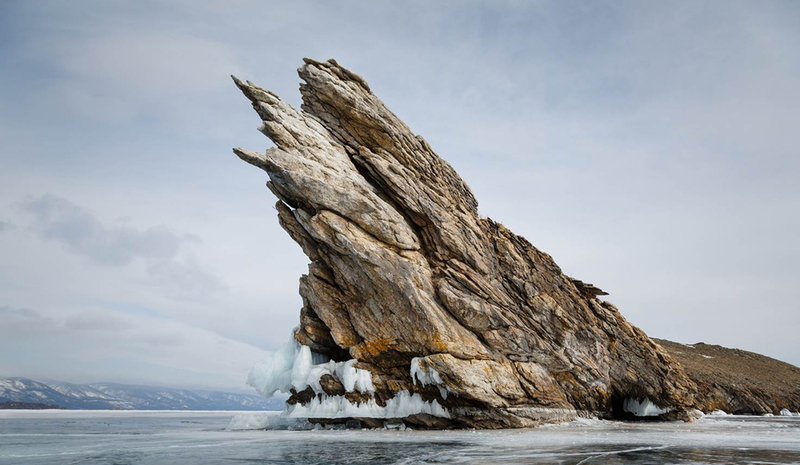 It attracts many tourists who plan to spend some time along Lake Baikal. Your lodgings today will be in an eco-friendly hostel, yielding a beautiful view on the relaxing landscape, including some nearby nice little restaurants! Following breakfast you will have ample time to relax or to undertake a walk to an outlook sightseeing post, some 90 minutes further up from the hostel. The last stretch of this walk is pretty steep, allowing you – if necessary – to take a ski lift to the top, where only a clear sky provides a stunning view on the surrounding landscape! You will find an extra option to participate in a Hoovercraft-ride over the frozen lake. It is also possible to this by snowscooter of by dogsledding; even crosscountry skiing is an option! These extra excursion are additional options and allow for reservation with local providers. Costs are not included in the prices mentioned here for this trip. In the afternoon a 90 minutes bus transfer will take you to Irkutsk. 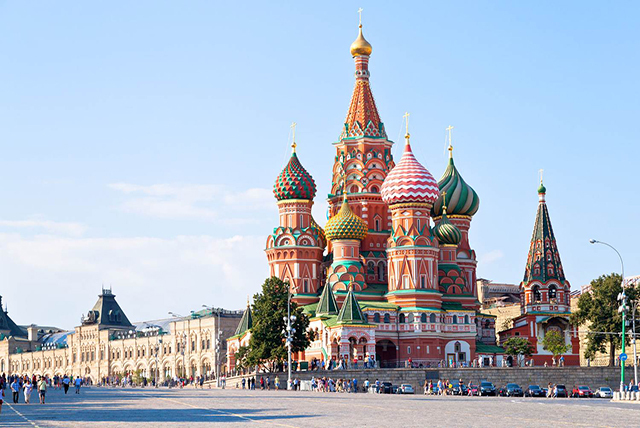 Today a transfer by plane will take you from Irkutsk to Moscow. Following this flight (that lasts 5½ hours), you experience 2 to 3 hours extra waiting times, before flying back from Moscow to Amsterdam. • Reservation costs € 12,50 p.p. • Calamity insurance € 2,50 p.p. • Travel and cancellation insurance. An official travel ionsurance is obligatory fort his trip! This ice skating trip is subject to the ANVR-Consumer Conditions.